Flash back opening – 1982, Boston and Ingrid’s first arrival. And visiting a psychic to find Emma and is not amused that she’s a fraud. She storms off vowing to find Emma. 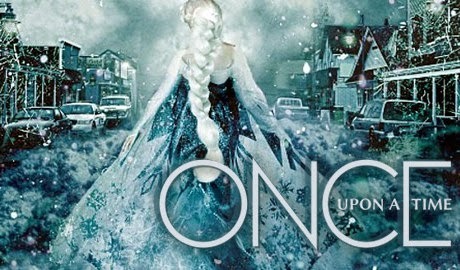 And then we move to Storybrooke, now, with the mirror shattered and chaos descending. In the police station Mary Margaret and Charming are snarling at each other (which is so wonderful to see) and Kristoff is saying mean things to Anna – Anna, Elsa and Emma are all immune. And Emma reassures them she’s the Saviour – I love Anna’s line “is that like a real job here?” Clearly she doesn’t realise how often this town needs saving. But Anna does remember what the legend says would stop the mirror’s magic – killing Ingrid. Sounds good – make with the stabbing! Of course everyone’s too wet to plan a murder, so instead Emma and Elsa head out to find another way, leaving Anna behind (because she’s useless in just about every way possible). That leaves Anna to convince the Charmings not to hate each other despite them being much more fun this way. Elsa and Emma go to confront Ingrid – but the ribbons they’re wearing stop their magic hurting Ingrid. And she’s sure that Elsa and Emma will totally love her soon. They try to take them off but they can’t – but Emma believes that to counter the love-ribbons they need to find some super hatred. Emma thinks the best source for some magically enhance hatred of her is Regina. This calls for a flashback to when Emma was fostered by Ingrid and Ingrid was a kind of awesome foster mother. Which eventually develops into Ingrid planning to adopt Emma. Everything is going wonderful until Ingrid decides to tell Emma she’s magical and drag her in front of a moving car to prove it. Emma is not amused and pretty devastated that the woman willing to adopt her seems to be so disconnected from reality to a dangerous degree. Later, in 2001 when the first curse hit, Ingrid uses the scroll she got from the Sorcerer to get into Storybrooke. In 2011 Emma is in town and visits the ice cream parlour – and sees Ingrid. But this is Emma pre-revelation and Ingrid babbling away about apprentice, magic et al and is pretty hostile. Ingrid takes her memories. To the present - and evil!Regina is stuck in her own vault and decides this is all Emma’s fault. Evil Regina also has a much more awesome wardrobe. Emma and Elsa approach her vault to initiated Operation Suicide By Evil Queen. Emma uses her magic to bring down Regina’s barrier. Now Emma just has to antagonise Regina (“how do you walk in that thing?” “with the poise and composure of a queen”. Ah Regina). Emma tells Regina she deliberately brought Marianne back to break Regina’s heart AND she’s happy with Hook so she can flaunt it in front of Regina – yep, that’ll get the hatred flowing. Regina’s spell burns away the ribbons. Emma throws Regina back against the wall then she and Elsa run. Very very fast. Anna and Kristoff were magicked to the beach where they argue because Kristoff is cursed and Anna knocks him unconscious with a bottle – that would be the bottle containing the note from her parents. Killian goes to meet Gold in his shop – Killian is immune because his heart was removed (shame they didn’t mass remove hearts before the curse) and Gold is immune because he’s the Dark One – he curses other people, thank you very much. He plans to take himself, Belle (Killian bringing Henry) and go to the edge of town and tomorrow use a spell to free himself from the dagger and the town. He even has a whole narrative planned to tell them that will make him the hero. Henry is barricaded in Regina’s office and he won’t open it - cursed Henry doesn’t like Killian. Killian uses an object Gold gave him to bring down the barrier – and walks right into Henry’s marbles trap. Henry runs, Killian tries to follow but is stopped by an angry, cursed Will Scarlett who is quickly knocked unconscious. At Ingrid’s frozen cave, Ingrid realises Emma and Elsa have de-ribboned themselves. Ingrid is sure she can convince them otherwise by returning the memories she took from both of them – except they’re edited to only show the good memories they have, the bad memories removed. She also points out that Elsa and Emma need to kill her and they haven’t because LOVE (I say because soppiness). Emma’s willing to go ahead anyway when Anna arrives with the letter; Anna quickly reads aloud the letter from their mother saying how she should never have made Elsa hide her powers and what she did to Ingrid – the letter goes on to say how wonderful Ingrid was and how wrong Gerda was to hate her. The letter begs Elsa and Anna to find Ingrid in her urn and release her. After looking all soppy, Ingrid throws Elsa and Emma across the room and starts magically strangling Anna (with that… ice magic?) who still manages to gasp about the wonders of family. Ingrid reads the letter which comes with its own crystal memories full of happy joy joy from Gerda about all the good times the sisters spent together. One letter and Ingrid has a complete and utter redemption moment . Ingrid now declares she is a monster because of the evil things she’s done and the only way to save the town is to kill herself. Did she get whiplash from that about face? Emma and Elsa are all sad about this and try to stop her (for some reason?) but Ingrid’s super happy because Emma and Elsa have families and it’s all nice – she passes on their memories as well as the bitter sweet tragic music plays (hey, also could you save Marian? Please? Maybe?). Lots of tears and sadness and happiness – and Ingrid dies and joins her sisters. To the town and everyone stops trying to kill each other. Damn it, just 10 minutes and I’m sure Regina would have killed Mary Margaret. Can Regina at least keep the dress (though them all falling apart with laughter over what she’s wearing is almost worth it) and we have a town wide love-in with hugging everywhere (apparently no-one was murdered. Or no-one we care about anyway). Killian has to return to Gold to say how he failed to kidnap a child. Killian begs for Emma and the town to be spared – but Gold has no reason to hurt anyone so long as they leave him alone to leave town. Of course, he makes no promises for the state of the rest of the world. Oh hey Gerda wants Ingrid out. She says, in a letter, just before she drowns and the only way this letter can be delivered is if the bottle happens to float to shore (also, the cynical may note, AFTER she has ruled as queen for some time despite being the third sister). Well such love – all sisterly bonds are now healed, this is in no way the very definition of too little, too late. Which kind of applies to the entire Frozen storyline for this whole season. The writers have been determined to leap on the Frozen bandwagon and they didn’t care if they fit or not, or if they had any real coherent storyline there. The whole thing is rough, dubious with sudden leaps of character development that make no sense (Emma’s magic out of control, Emma’s family’s fear – it was blatantly shoe-horned in) leaving actual storylines that could have been interesting (Gold, Regina, Emma learning how to use magic) left out and undeveloped either ignored or advancing with no real explanation as to why. And on this mid-season finale we confirm the ongoing appalling diversity in this series: Marian showed up and was quickly frozen, Regina has spent a huge amount of time in the plot box this season. There are no LGBT characters and Mulan has no only fallen off the planet but no-one has even noticed she has (nor has the show even confirmed its hint at her possible bisexuality).